American Legion Post Hall is available! Planning a special event that might be a wedding reception, change of command, promotion, retirement, birthday, training and business meeting, school or family reunion, anniversary, bridal or baby shower, ship’s homecoming, bridal or baby shower, Chief’s selection work party, or? 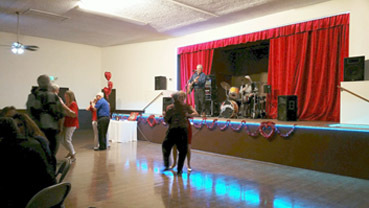 We have an outstanding banquet hall with a full-size elevated stage that can accommodate large bands or other performers. The room can be arranged to accommodate small or large groups not exceeding 299, with food and a full bar and bartenders serving beer, wine, spirits, and soft drinks. Tables and chairs are available as is an adjoining kitchen that may be made available (we can also suggest caterers). We are in a centralized location, close to the Freeway 8 and near motels. On-site parking is plentiful and normally not a problem with plentiful off-site parking just across the street. 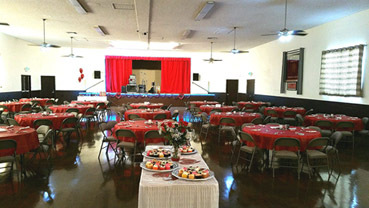 The banquet hall is available any day of the week, including weekends; hours available matching your needs. Suggested donation list is affordable, much less than other venues with the same accommodations offer. 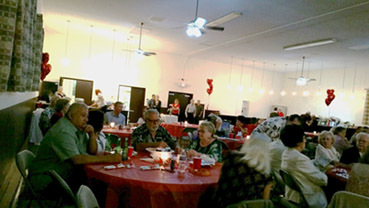 The banquet hall is available to the Public and our members and other veterans on a first come, first served basis. Revenues from use of the hall are used to support our various programs that benefit our membership, veterans and their families; active duty, retired, and prior military. Programs involve, but are not limited to, participation in such as Boys State, scholarships, recognition to members of the La Mesa Police, Fire, and EMT; JROTC, Boy Scouts, flags, and other Americanism recognition. Revenue is also used for the Vietnam Memorial that is owned and operated by our American Legion Post 282 and to ensure a facility exists that provide benefit and other counseling, social, and other needs of the veterans and their families within the City of La Mesa. Starting with bookings on 14 Feb 2016, users will find a complete remodel and a room that is quiet due to the installation of triple pane windows and curtains. Our restrooms will be fully ADA compliant and there will be lighting to accommodate various colors such as used with weddings. 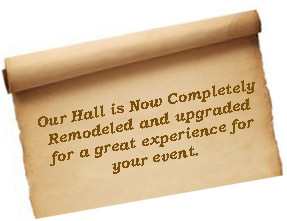 We will have a revamped sound system and other enhancements that will provide an environment suitable for any event. Reservations are now being accepted. Always available for public access and at no cost is the Vietnam Memorial, located on Nebo Street a few steps from our parking lot. This is a wonderful area for reflection and remembrance and is used for such as formal, military events involving reenlistment or promotion ceremonies. Call or email Lenny so your event can be scheduled and to ensure it is available for your needs.